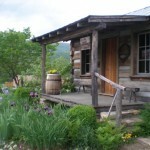 The Keffer Log House (2-story dwellings are called houses, not cabins!) was taken apart log by log, moved, and rebuilt during the summer of 1999 by Roger Davis of Montana and Robert Echols (1913-2013) of Happy Hollow. Mr. Echols lived next door to the Keffers when he was young. The house is now on Market Street between Food Country and our Medical Center. By the time the house was dismantled and moved to New Castle, it had four wood frame additions attached to it and the ceiling had been raised in part of the first floor. The house, when it was in Happy Hollow, had a metal roof and tulip poplar lap siding. None of the additions made the move. The lot on which this cabin is located was the horse corral used by folks coming to do business at the Craig County Courthouse.The adjacent property has a clause in its deed stating “there shall always be a path to the creek to water the horses.” The path and John’s Creek are several yards behind the cabin. The (fake) outhouse was built in the backyard in 2005 by Historical Society members George Field and Edwin Abbot. 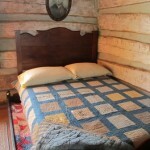 The most recent acquistion is a trundle bed from the estate of Ruth Martin Wills, originally from Sinking Creek. Her childhood chair hangs on the wall above it. 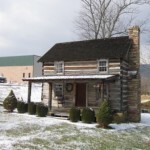 The Hawkins-Brizendine Cabin was built in 2000 of logs from the funeral home given by Buddy Boitnott and from the Hawkins homeplace on Rt. 614 given by Ashby & Flo Eakin. 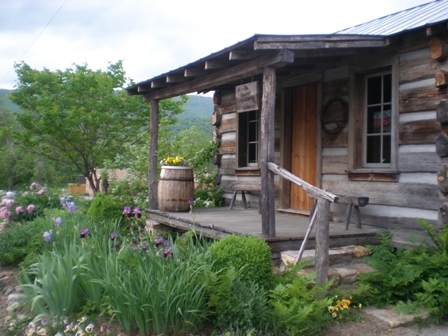 Volunteer workers on this one-story cabin included Bob Echols, Edwin & Curtis Abbott, Wes Carper, George Field, David & Shakey Boitnotte, and Lewis DeQuino, as well as useful advice and equipment from many others. It is next door to the Old Brick Hotel. 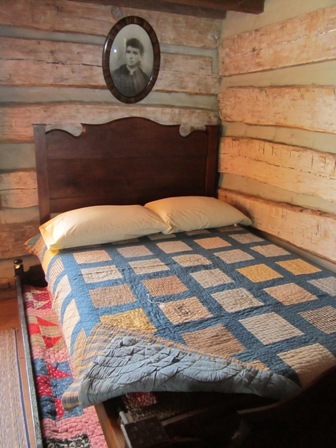 Cabins can be visited Fridays 1 – 4 PM April – November or by calling (540)864-5489, 864-5004 or 864-5066.